Shoes are most important piece of equipment in the sport of trail running. A nice pair of trail running shoes will keep your feet happy as you run long distances on uneven ground. Trial shoes are more stable than many other running shoes. For runners who required a well-built off-road trainer with added grip, trail shoes are best. Trail shoes give you best grip with stability and durability. There are so many things to be taken care of when going to buy trail running shoes. Now, in this guide, I am going to give you some tips for buying trail running shoes along with i will tell you which are the top 10 trail running shoes for women’s. Always look for trail running shoes with more stability over uneven ground. 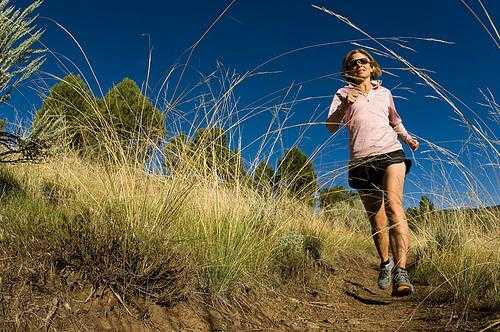 You should choose trail running shoes with adequate water resistance or waterproofing, depending on your climate. You will surely need decent cushioning for the surface you run on. Better cushioning for hard trials or concrete, with cushioning being less important if you run on grass, soft ground or sand. You should buy shoes which are specially designed for trail running. Trial shoes generally have more aggressive tread than road shoes. They are intended to help you on tight turns, on steep and slippery hills, and place where added support may mean the difference between a speedy run and a sprained ankle. You should go for shopping late in the day, when your feet have had time to swell to their maximum size. Go too early and you may end up with shoes that are extremely tight. You should understand that everyone’s feet are different and the best trail running shoe for one runner is not necessarily the best for another. Try on the trail running shoes at a running store or order several trail running shoes from online shoe stores and try them on at home. If you choose last year models, you can easily get discount and sales that means best price. Always try the shoes on and walk around the store or if the salesman says it is ok then you should jog down the block. You should limit your choice on two or three pairs of shoes, then go with whatever feels best on your feet. Brooks Trail Addiction – These shoes has very strong support which are balanced with cushioning, the hydro flow cushioning system absorbs shock, stabilizes the foot and minimizes excessive pronation. They are also water resistant as a trail shoe must be. New Balance Trail Runners – New balance has huge variety of trail runners and has lots of categories in every price and style. Nike Air Trail Shoe – They have trail running shoes for all the season, all condition runners who demands occasional or daily off-road innovation for tail or road running to the trailhead. Adidas Trail Runners – These trail running shoes are for those who need more traction and good, snug fit. The supernova is designed for primary off-road use but can be used for road running. Mon Trail Runners – These are very light, stable and very comfortable trail shoes. There are models which provide motion control for models that are made for warm weather and high miles. The North Face Trail Runners – These shoes have extra build and features of an aggressive ultra-runner. They have huge varieties available in the market. Merrell Trail Runners – These are known for great hiking shoes and now they have great variety of trail runners as well. From the ultra stable Mesa to the sleek and nimble Flash, you are bound to find the perfect trail runner in the Merrell arsenal. Vasque Trail Runners – They have lots of variety of great hiking shoes. They have designed a stable full of trail running shoes for rock scramblers and trail runners who like to move fast or their feet. Teva Trail Shoes – They are new in the running market. They have very few to choose from. They have designed to provide the best fir for cushioning and stability in all trail conditions they provide all-terrain traction and abrasion resistance over miles of uneven trails. Asics trail Runners – They have several trail runners including the Gel-Eagle Trail, a top of the line trail runner designed to keep a runner’s feet in a neutral position on even the most uneven terrain. I hope this much information will be enough for you to make up your mind on which trail running shoes to buy for you. Subscribe our RSS to receive latest updates on women’s sports shoes.